Thanks for the explanation, Rik. Note: I've kept a couple of interesting samples in FAA (Formalin-Alcohol-Acetic Acid), so they can be stored for years. By killing in fixative the sporangi opening reflex (activated by light) is eliminated. Sorry but that was stated based on incorrect information. After removing the item from FAA (fixation completed) the spores kept on popping up as they did. The only remedy was to reduce the excitation by using a thicker excitation filter. Furthermore I added 2 other filters. This combined with higher iso value and longer shutter speed. This setup was used for picture 9. @Pau: no photobleaching noted with above setup..
For picture 10 I've tested my 95x/1,0 (oil immersion) objective with spores. Fortunately the spore in the picture did not move around in the drop of oil. UV excitation and green filter block. The first picture I've taken with that objective! Picture 11 shows a "garden fern" growing as street decoration. The sori of this one are like crusts that crack open from one end when the sporangi need to be released. 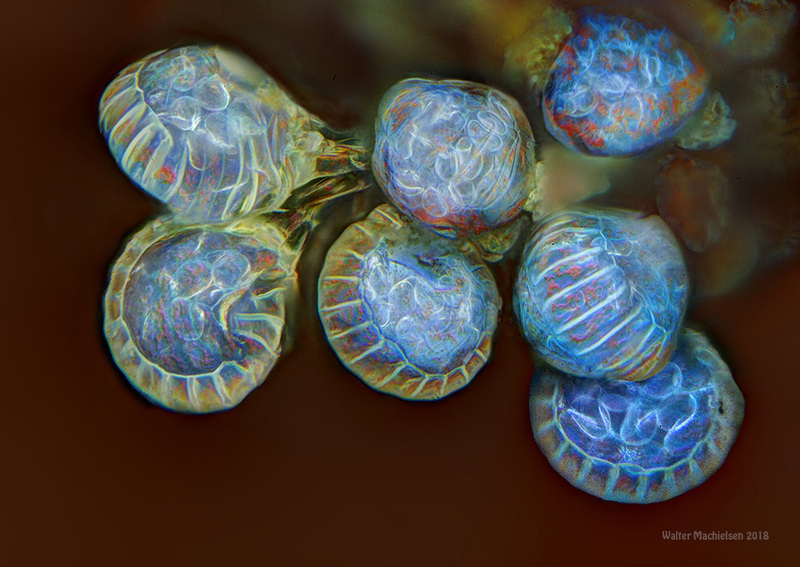 As you see, also these were empty, however interesting autofluorescence. @Pau: no photobleaching noted with above setup. Thanks. Do you refer to the fixation method or to the filters combo? If you're not already doing so, and if the time between exposures is long, you can reduce bleaching by placing a shutter between the lamp and subject, opening it just before and closing it just after the camera shutter opens and closes. Probably a silly question. Does the specimen recover to some degree from the fading that takes place during a stack or is the fluorescence consumed, so to speak, never to be seen again? In my case, because I use LEDs for illumination an electronic driven switch would be more convenient, although for now I'm not able to design it. My time between frames is about 2s, but chlorophyll bleaching is too fast. Will try first with reduced intensity and longer exposures. I've not seen any recovery, even illuminating the leaf with white or red light after bleaching. Do you refer to the fixation method or to the filters combo? I referred to the filter combo. However overlooked the absence of photobleaching of the sporangia. Like you mentioned chlorophyl is especially subject to this phenomenon. Interesting you mentioned the stomata are less affected, indeed this can be seen in the pictures and during observation. It would be interesting to know what other substances, besides chlorophyl are affected by photobleaching in particular. Fixation did not seem to affect the colour of the sporangia, the green of the leaf has faded though. (typical for FAA) I did not notice any chlorphyl radiation at all after fixation, exposed or not. The edge of the leaf (the lower part in picture 9) would otherwise show red. My typical shutter speed is 1 second (for photo 9 that's 2.5 seconds) the pause between two exposures about 6 to 7 seconds. This would reduce the exposure with more than 85%. A challenging new project to link this to my setup (no flash but HBO 100/103 mercury short-arc lamp). There are no silly questions I learnt. . No, as Pau mentioned I did not find the photobleaching effect to disappear after a longer period. By the way: picture 9 22x/0.37 objective; picture 11 9x. 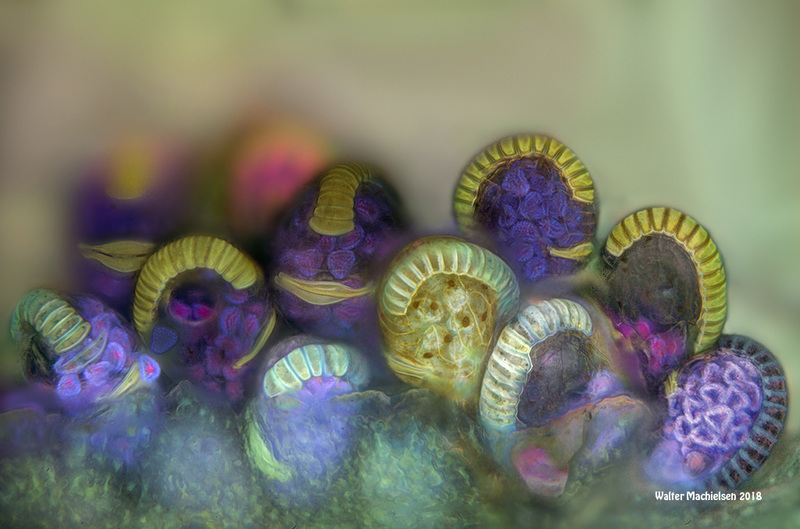 The globules released are the spores; the stalked capsules are the sporangia; and the sorus is the cluster of sporangia (sorry to be pedantic: I come here as a student of ferns, just started with microphotography). 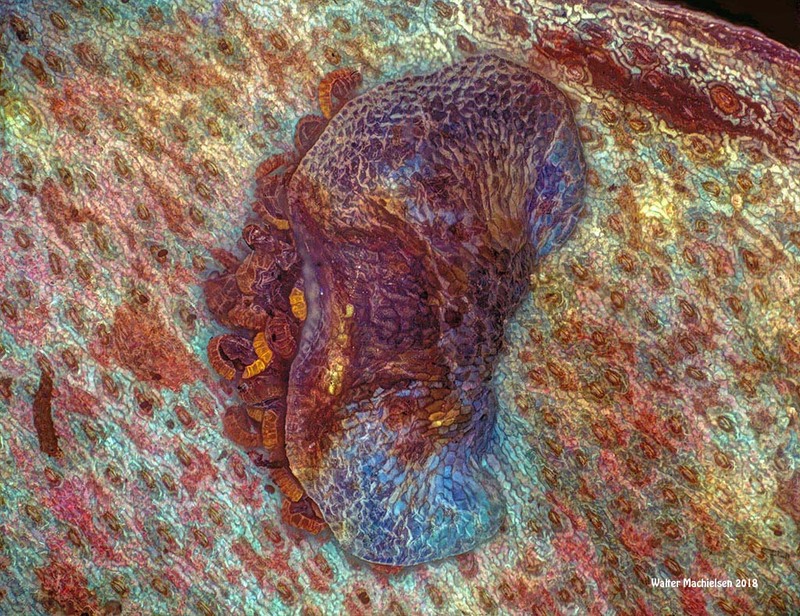 The sporangium opens and the spores are thrown around when the structure dries and the content of the annulus cells - the thickened cells so well shown in your pictures - contract. It's heat and drying that cause this, light has no influence unless it is hot too. Iconoclastica, I was hoping for feedbacke like yours because I was not sure about what's actually triggering the Sporangia to open up. Thanks for the clarification. Is there a wide variety in sporangia? I noticed they respond different (colourwise) to UV excitation. To be honest I did not want to add more pictures to this post. However, yesterday when looking for mosses, I came across another fern (here in Holland) with unopened sporangia. I've followed the advise to minimise exposure to the lamp when not taking the picture. Did this by lowering a piece of cardboard in one of the (empty) intermediate compartments between the lamp and the revolver which resulted in less photobleaching. Is there a wide variety in sporangia? Not really, the vary in number and size of the annulus cells. Some tropical species have tiny thorns on top. Only the Royal Fern (Osmunda regalis) is of a much more primitive type and quite different. If you come to warmer regions, you may want to have a look at the filmy ferns (Hymenophyllum and Trichomanes) where the annulus is oblique and runs nearly around the sporangium. The spores, on the other hand, are much more variable and have great diagnostic value. They are in fact the primary reason I want to start with epi-illumination. If you refer to your last pictures, the fluorescence differences between sporangia in the same sorus can be due to different state of maturation, I've observed it too. Fantastic images again, Walter ! Sounds like there will be much more to explore for a follow up thread. That's a very interesting observation Pau, indeed the less mature sporangia appear lighter, radiating more, while the riper ones are darker purple. Didn't hear/read about this before! 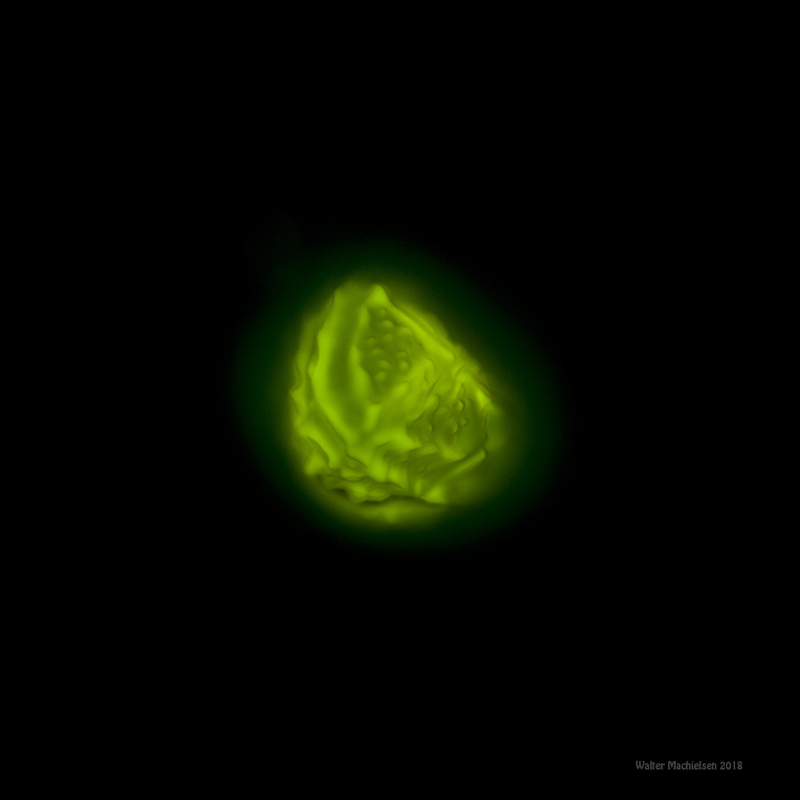 See this photo for an example of the influence of the development on the fluorescence. Young cells of the annulus contain chlorophyll (red). In some of Walter's photos it can be seen disappearing. 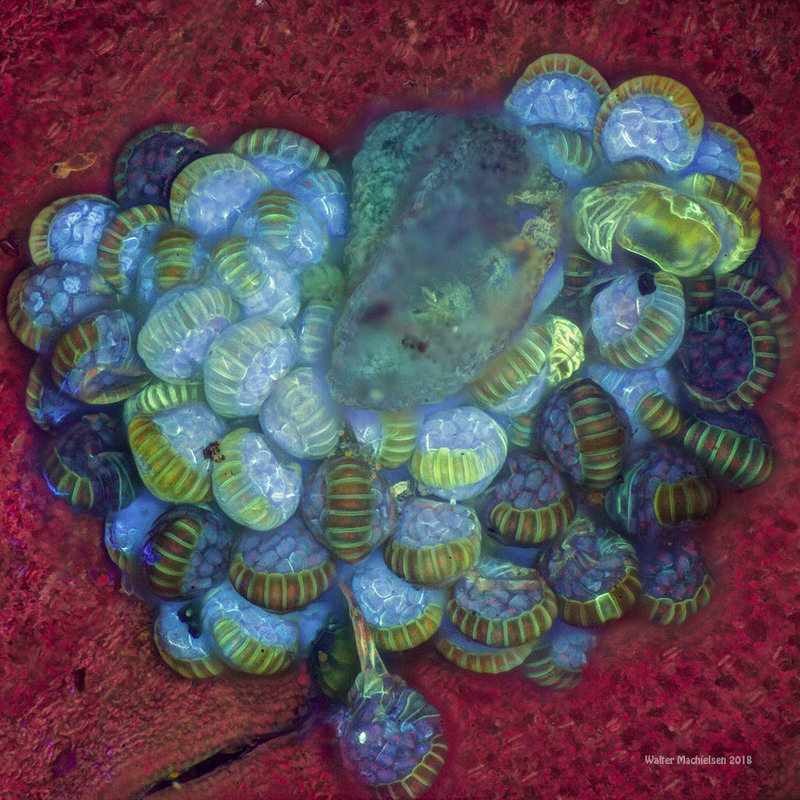 Bright blue autofluorescence of the spores indicates the presence of sporopollenin. The sporangial walls emit yellow under blue light excitation. I hope to find out more about this, but I cannot acess the most important publication yet.